... intelligent, forthright book [that] contends that American homosexuals have achieved only the appearance of acceptance. Valuable ... and frightening. We enjoyed having Urvashi very much--and everyone was very enthusiastic about Urvashi’s lecture! The conference was a bigger success than we could have dreamed--Urvashi's keynote was the perfect close...she received two standing ovations! 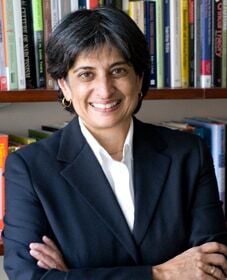 As the Director of the Engaging Tradition Project, Vaid studied the use of tradition in arguments by advocates of gender and sexuality-based social justice projects to shape legal and legislative strategies, frame public education messages, and strengthen arguments that advance the rights of groups seeking social justice. Former Director of the National Gay & Lesbian Task Force’s Policy Institute, she remains committed to being an LGBT Leader through community-based change, strategic thinking and coalition building.